It was the photo that moved millions to tears. The picture of five-year-old Omran Daqneesh, caked in blood, covered in dust and clearly in a state of absolute shock after an air strike on his home in Aleppo, Syria in August last year was shared millions of times on social media. Read more: The story behind this image is making headlines all over the world The heartbreaking image sparked global outrage against the war. Now, almost a year after the devastating bombing in which Omran's 10-year-old brother Ali was killed, his family granted an interview to Lebanese TV station Al-Mayadeen. 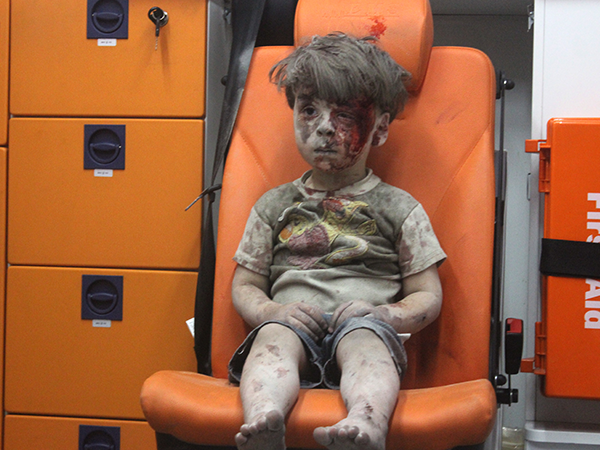 In the video, Omran looks healthy and happy as he sits on his father's lap and smiles at the camera. He also gets up and waves the Syrian flag. Journalist Kinana Allouche also shared a picture of Omran with the caption, "The child Omran, those who tried to shed Syrian blood misled the news that he was hit by the Syrian Arab Army. Here he now lives in the Syrian state with its army, its leader and its people."